Politico — On the morning of February 8, a civil servant from Buffalo, New York—a Somali by birth but an American by choice—walked into a heavily guarded airplane hangar in the battle-scarred capital of his native country where an important vote was about to take place. When he emerged that night, he was president. His surprise victory, which was celebrated with gunfire and camel slaughter in Mogadishu and high-fives at the Buffalo office of the New York Department of Transportation, where he was still technically employed as an equal opportunity compliance officer, was all the more remarkable because it came at the very moment a federal court in the U.S. was deciding the fate of a travel ban that targeted refugees exactly like him. The story of how Mohamed Abdullahi Mohamed came to be the leader of a country that is synonymous with anarchy and terrorism is both a classic American immigrant’s tale and one about the age-old conflict between basic democratic principles and the forces of political corruption. It begins in 1988, when Mohamed, then a first secretary for the Somali embassy in Washington, D.C., decided it was too dangerous to return home and applied for asylum. Back then, the U.S. was inclined to say yes to such requests. Over the next 25 years, he earned degrees in history and political science, served on local campaigns and acted as a spokesman for other refugees as an elected official, slowly absorbing the lessons of civil society and the basics of American midmanagement that he knew he wanted one day to bring back to Somalia. He had become, in some ways, an export-ready product. Not soybeans or computer chips but democratic values. In fact, the refugee-turned-president might just be one of the most powerful arguments against a travel ban like President Donald Trump’s, which would have barred Mohamed’s entry to the U.S.—it ultimately diminishes American influence abroad. Mohamed had never been eager to leave Somalia. He was born into a well-connected clan, and his father, who spent much of his life under Italian colonial rule, was a government employee. He nicknamed his son “Farmaajo,” which is a local version of the Italian word for cheese, one of the boy’s favorite foods. After graduating from secondary school, Mohamed had access to a job with the foreign ministry, and in 1985 he was sent to Washington, D.C., to work in Somalia’s embassy. But in 1988, Mohamed criticized Somalia’s authoritarian government, and, fearing he could not return home safely, he requested political asylum in the United States. Mohamed brought his wife to Buffalo, where a community of Somali refugees had begun to settle a few years earlier. They moved into public housing while he pursued a bachelor’s degree in history at New York State University in Buffalo. A year after his graduation, Mohamed’s fellow tenants elected him as resident commissioner, which automatically placed him on Buffalo’s Municipal Housing Authority. He earned a reputation as a community organizer who Buffalo immigrant and Muslim voters looked toward for leadership. In 1999, Mohamed rallied minority voters to support Giambra, a Democrat-turned-Republican running for county executive, and Mohamed registered as a Republican. When Giambra won, Mohamed took a job in his office as the county’s minority-business coordinator. He parlayed that, in 2002, into a similar job with New York’s Department of Transportation. For eight years, Mohamed enforced nondiscrimination and affirmative-action requirements among state-employed contractors—policies that are totally alien to Somalia, where government jobs depend on clan membership and public lands are practically given away to friends and allies of those in power. In 2010, not even a year after receiving his master’s, Mohamed got a chance to talk about these issues with someone who actually could do something about them. The then-president of Somalia, Sheikh Sharif Sheikh Ahmed, came to New York to attend the U.N. General Assembly, and Mohamed, via friends of friends, arranged a meeting. According to Mohamed, he wanted to give the president his advice—one manager to another—on what Somalia could due to cut down on corruption. The meeting went well; so well, in fact, that a few days later, Mohamed received a phone call from the president’s staff. He was on the president’s short list for prime minister. After discussing it with his wife, Mohamed asked his supervisor for three weeks of vacation, explaining he would go to Mogadishu for an interview, and there was a chance he wouldn’t come back. A month later, in Somalia, Mohamed was sworn in to his new position. Mohamed’s sudden ascension to prime minister wasn’t as strange as it seems. In fact, among the seven countries included in Trump’s attempted ban, most boast influential officials who spent time in the United States, usually to attend school. Former prime ministers in Yemen and Libya attended American universities. One of them, Shukri Ghanem, was a reformer who worked, with some success, to push Muammar Qadhafi toward reconciliation with the west. Javad Zarif, the Iranian foreign minister who oversaw negotiations on the Iran nuclear deal, went to a private high school in San Francisco and received a B.A. and M.A. from San Francisco State University and a Ph.D. from the University of Denver. An influential rebel leader from Sudan who was a key player in the country’s 2005 peace agreement, John Garang, attended Grinnell College in an Iowa town of 9,000 surrounded by cornfields. 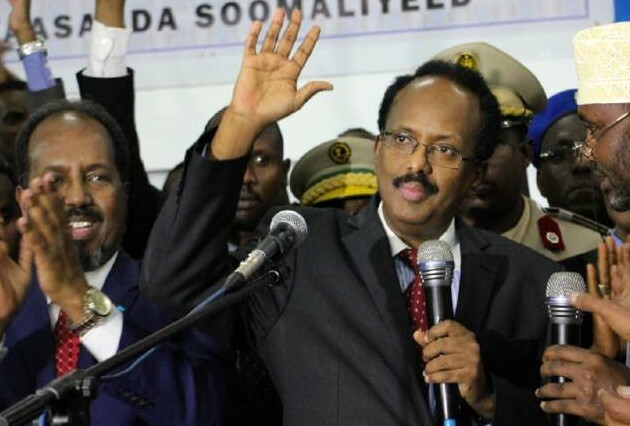 When Mohamed began his tenure as prime minister in September 2010, he did in fact work to push back al-Shabab, Somalia’s largest terrorist group, and he helped the army to establish the rule of law in 60 percent of Mogadishu. But what really won Mohamed the love of the people was his reputed distaste for corruption. He reduced the size of a bloated Cabinet from 39 to 18 and nominated others from the diaspora like himself. He required all of them to declare their assets and sign a code of ethics, a policy he possibly picked up from his time working for the New York state government, where he was required to sign a “Public Officers Law.” Mohamed also drew on his experience as a bureaucrat in Buffalo to establish a system in which commanding officers could not keep for themselves the stipends that were meant for rank-and-file soldiers. Not everyone is convinced that Mohamed deserves the popular support he enjoys. “The improvements in Somalia have been in spite of the government, not because of the government,” said J. Peter Pham, director of the Africa Center at the Atlantic Council. Pham believes that, for the most part, Mohamed benefited from low expectations and that credit for keeping the country stable should go to the African Union forces, which did much of the work to help secure Mogadishu and fight back al-Shabab. “Anybody would have been an improvement over the president that appointed him,” said Pham, “who was widely acknowledged to have stolen roughly 96 percent of bilateral aid.” That’s $72.7 million that simply went missing. But regardless of one’s opinion on Mohamed’s efficacy, his status as a popular hero in Somalia was cemented in June 2011, when Mohamed fell victim to a backroom deal engineered by President Sharif Ahmed, the man who appointed Mohamed, and Sharif Hassan Sheikh Aden, the speaker of parliament who was aspiring to the presidency himself and saw Mohamed as a roadblock to his ambitions. The two men agreed to postpone elections until August 2012, giving Ahmed another year of power. As part of the deal, he would have to dismiss his popular prime minister. The blowback was immediate. Rioters took to the streets in support of Mohamed. They burned tires and set bonfires, blocking peacekeepers from getting to their destinations. Soldiers, who Mohamed had won the loyalty of by guaranteeing their pay, abandoned their posts and joined the protests, waving pictures of Mohamed above their heads. The deed was done, however, and Mohamed no longer had a reason to stay in Somalia. He returned to his wife and kids in Buffalo, and resumed his position as a regional compliance specialist for the New York Department of Transportation, with a salary of $83,954 a year and the promise of a state pension after only seven more years of service. Mohamed was glad to be reunited with his family, and there were some things he definitely didn’t miss about being prime minister. Five of his bodyguards had been killed, and he never forgot the sound of bullets hitting the reinforced windows of his house. But his colleagues were right that he hadn’t given up on his political dreams in Somalia. He decided to run for president in 2012. Mohamed, along with his former Cabinet members, established a new political party called Tayo—meaning “quality” in Somali. Mohamed lost in the first round of voting, winning barely 5 percent of the vote. As a parting shot—payback might be a better term—he threw his support behind the candidate running against the incumbent president, the man who had dismissed him as prime minister. Mohamed’s man won. Mohamed was using a playbook familiar to any American campaign, but news agencies were reporting that the election was shaping up to be a classically Somalian affair, possibly one of the most corrupt in the country’s checkered history. Security was so bad that a national election couldn’t be held. Just two weeks before voting, a car bomb attack on a Mogadishu hotel killed 28. That meant that once again it would be up to the 328 members of parliament, a notoriously bribe-susceptible group of politicians. Market prices for a vote were high, observers said. The incumbent president, who by all reports had only exacerbated corruption in Somalia during his tenure, was widely reported to have offered $50,000 to anyone who voted for him in the secret ballot. On Election Day, parliamentarians met in a heavily guarded airport hangar in Mogadishu. African Union peacekeepers stood watch outside, wary of attacks by al-Shabab. The parliamentarians were forbidden from taking large amounts of cash or cellphones into the hangar, lest the voting floor devolve into a televised auction for votes as it had in the past. In the first round of voting, 17 of 21 candidates were eliminated. Then an additional candidate withdrew, leaving three contenders: Mohamed, incumbent president Mohamud, and former president Ahmed—the same man who had appointed and dismissed Mohamed seven years earlier. Mohamed and his office could not be reached for comment. But the reports of a corrupt election have not dimmed public enthusiasm for the civil servant who ran on the platform to clean up the Mogadishu swamp. Celebrations in the streets revealed a populace that was ecstatic to have a president who won their affection years ago—not a blatantly corrupt consensus choice of the clan elders. U.S. officials might be feeling equally sunny about his prospects. Here is a man well-versed in the ways of American politics, who is deeply popular in his country, vocally supportive of beating back the forces of Islamic terrorism and committed to bringing stability to the failing institutions that often enable groups like al-Shabab to thrive. The U.S. ambassador to Somalia, Stephen Schwartz, gifted President Mohamed a hat that says “Make Somalia Great Again” on Friday, February 17. On his first day in office, Mohamed did take a small step forward. Avoiding any appearance of double-dipping, he resigned from the New York Department of Transportation.